That sounded to me like a mighty fine place to start . . . a few simple steps. 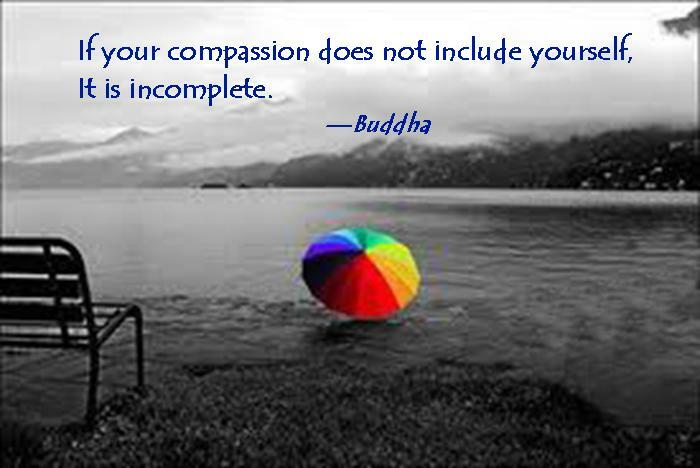 I’m certain the first step involves coming to understand what is blocking our self-compassion and self-acceptance. As far as I know, we weren’t born with self-contempt or an active inner critic. Does it enter a baby’s mind that she might be crying too loudly or burdening her parents with yet another dirty diaper? Are babies born with a list of expectations in hand? I don’t think so. Guilt is learned—acquired later after we’ve been here for a while. If we don’t like ourselves, or if we’re accustomed to beating ourselves up mentally, it’s due to what we’ve been exposed to in the world—our conditioning. At some point, we bought into the idea that our flaws are unforgivable, that we’re unlikable or that we need to be hard on ourselves for failing to live up to certain standards and expectations. We are shaped by the prevailing culture of the time, and the many with whom we share our life experiences. Our job is to disentangle ourselves from the limitations of all that. The key to escaping this murky quagmire of self-degradation is by disbelieving how we’ve been conditioned to see and think about ourselves. But what, you may ask, does this look like in my daily life? What is disbelieving and how do I do it? We’ll tackle that the next time . . . stay tuned! As always, I welcome your feedback.